It’s officially summer; the heat is high and heavy. I think of all the ways people responded to this sort of heat before air conditioning. They hung signs on shop doors “Gone Fishing”; pulled down shades and took naps; gathered on porches to fan themselves, talk and drink iced tea. Now, we have outdoor heat alerts. But indoors if there is air conditioning, we are working, working, working. Maybe we need to pay attention to the weather; remember the rhythms of nature and how they helped us to slow down. 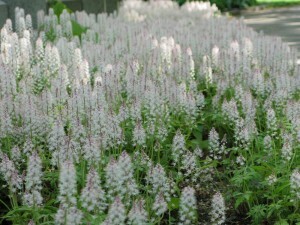 I saw a wide patch of flowers this morning and they looked so soft I wanted to lie down in the midst of them. My eyes overlooked the weeds and paid attention to their feather-like blossoms. It made me want to be lazy- something I never am. Once I started writing this, the moment I wrote the word “lazy” I knew I’d try it out. Being lazy for the rest of the day. We move so fast; push ourselves so hard; worry about not enough time. If we rest, there will be more time. 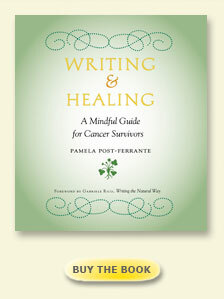 In creating the sessions of this book, I have tried to think of everything that would have made it better for me when I had cancer, and afterwards when I had no idea of what to do. I first wanted to create a community of healing, for I had the experience of people treating me differently and avoiding me the more difficult my life became and the more I needed connection. Many didn’t know what to say or do. It was easier for them to go on with the friends who were healthy. After the third and fourth diagnosis, very few people were left. My husband, too, was gone by then. But even when you are lucky enough to have an abundance of friends and family, they still don’t understand how cancer can change your life. Did, or has, your community changed while undergoing treatment?